The FDA-cleared extriCARE™ 2400 Negative Pressure Wound Therapy pump is portable and battery-powered. The device generates negative pressure (suction) to remove wound exudates, infectious material, and tissue debris from the wound bed, which may promote wound healing. 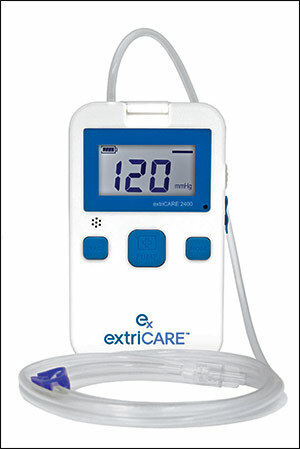 The extriCARE™ 2400 Pump is used with Devon Medical Products’ proprietary extriCARE™ bandages. These bandages have a wound pad enclosed in mesh under a sticky film that can be applied directly onto the wound bed. There is a drainage tube that connects to a canister adjacent to the pump that collects exudates and bodily fluid. The bandages come in oval shapes as well as other designs. 45 minutes). This allows wound care nurses and caregivers to see additional patients more quickly. promoting an active wound healing lifestyle. Anatomically Fitted Bandages: Create tighter seals for all parts of the body, including various sizes and specialty bandages for the foot, and sacrum, etc. Rechargeable Battery: 24 hours of continuous battery life, and the battery is rechargeable. Able to handle multiple wound sites with use of Y Bridging Kit. 1. LCD SCREEN: Indicates the pump operating pressure and displays symbols (also features a blue backlight). Tubing which connects canister to drainage tubing. much battery power is left. Icon has 1-4 bars representing 25%, 50%, 75%, and 100% battery power. the canister to the NPWT device. 6. MODE BUTTON: Allows user to set the pump to either continuous or intermittent mode. 7. POWER PLUG: Enables user to charge device. 8. PUMP BUTTON: Used to turn pump on or off. Also can be used to exit a setting. 9. SET BUTTON: Used to program desired pressure. 10. POWER SWITCH: Used to turn the system power on and off. POWER ON/OFF: To Power on the device, push the POWER SWITCH on the right side of the device downward. The device should then turn on. Push the POWER SWITCH upward to turn device off. 2. CONTROL PRESSURE: Holding down the SET key for two seconds will initiate the procedure for setting the pressure. The screen will display a flashing pressure reading at this time. Press SET once to increase pressure by 20mmHg. In order to obtain a lower pressure, scroll through by pressing SET button. The pressure will increase until 140mmHg, and then will start at 40mmHg again. When desired pressure is reached, press the PUMP button to confirm and exit pressure settings. 3. SET MODE: Hold down MODE button for two seconds to select the mode (continuous or intermittent). A dotted line at the top right of the LCD Screen indicates intermittent treatment while a straight line indicates a continuous treatment. To change current mode, press the MODE button. To exit Mode Settings, press the PUMP button. 4. START/STOP TREATMENT: To start treatment, hold the PUMP button for two seconds. Do the same to stop treatment. 5. LOCK: The locking feature prevents the settings from being changed. If no buttons on the device are pressed for more than 60 seconds, the lock will automatically turn on. If the Lock is on and buttons are accidentally pressed, nothing will be changed. Press the SET and MODE button simultaneously for 2 seconds to turn the lock on manually. Repeat for 3 seconds in order to unlock. The backlight should turn off when the device is locked and turn back on when it is unlocked. 1. The clinician may loosely place extra gauze dressing material into areas of undermining and tunneling. The decision type of gauze material used is based on clinician preference. Document the amount of additional packing material used. 2. Dressings should be changed as needed. • The initial dressing should be changed in 24 - 48 hours or when leaking, whichever comes first. Dressings should not be left in place longer than 72 hours. removal. Adhesive remover may be used. • Dispose of soiled dressings according to facility protocol. 3. Avoid outside sources wetting the dressing. The dressing should be protected from moisture during bathing or changed prior to reconnecting to the pump. 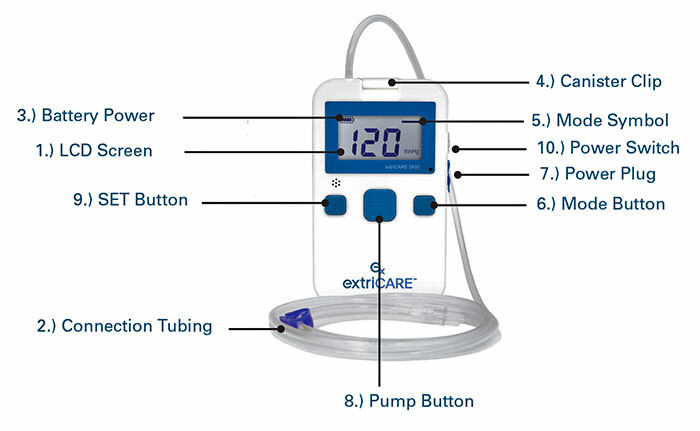 Do not use the extriCARE™ 2400 Negative Pressure Wound Therapy Pump while showering or bathing. Always disconnect and remove pump from areas of moisture (bathing area or tub). Clamp the tubing when pump is disconnected. 4. To remove a canister, pull up on the canister clip on the top of the device and pull the canister away. To reinstall a canister, line up the notch on the bottom of the canister with the hole for it on the extriCARE™ pump, and then press the canister clip into place. The clip should click into place and the canister should feel snug. 5. The extriCARE™ 2400 Negative Pressure Wound Therapy System is capable of accommodating more than one dressing set for multiple wounds on a single patient. A Y Bridging Kit is available to connect the dressings to enable the use of one pump. The model extriCARE™ 2400 is intended for use in the electromagnetic environment specified below. The customer or the user of the model extriCARE™ 2400 should assure that it is used in such an environment. 8 kV air Floors should be wood, concrete or ceramic tile. If floors are covered with synthetic material, the relative humidity should be at least 30 %. Mains power quality should be that of a typical commercial or hospital environment. If a dip or an interruption of mains power occurs, the current of the model extriCARE™ 2400 may be dropped off from normal level, it may be necessary to use uninterruptible power supply or a battery. NOTE: UT is the a.c. mains voltage prior to application if the test level.